An interesting idea for a movie that just goes in some very wrong directions towards the second half. An unusual sort of movie about wolf or werewolf attacks in New York, this one id mainly about the police investigation of murders and how it leads to some very strange places. Albert Finney is Wilson, the detective coming out of the murders, things are working pretty smoothly. But when it comes time for actually solving them and making sense out of them, the answers seem a little too far fetched. Especially in terms of how much they show the coroners and investigators didn’t realize. Let’s just say things don’t quite add up here and this movie in no way goes the direction one would expect. Normally that’s a good thing, so long as the film does hit certain necessary plot points. This movie doesn’t hit those, and it’s the reason why the second half doesn’t work nearly as well as the first. Wolfen is a strange movie. It looks and acts like a werewolf movie, only it’s got some other ideas up its sleeve and not necessarily for the better. It’s hard to say anything more than that without giving away some crucial surprises, so let’s focus on the first half of this movie and leave out the second half as much as possible. The movie is about a series of murders that take place in New York and the detective, Wilson, who is hired to solve them. 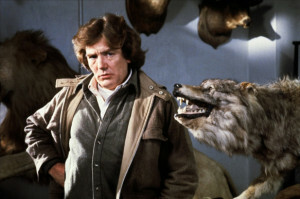 Wilson is played by Albert Finney, back when he was a leading man with rough edge seventies-style looks. About ten years after this movie, Wilson played an older gang leader in Miller’s Crossing. By that point he had really found his own as an actor. Wolfen comes more in Finney’s developmental stages, where he was playing a rebel, much like you would get from an Al Pacino in those days. The first murder is by far the best. It’s the one that the movie spends the most time on and really develops. This murder takes place in Battery Park at night as a developer named Van De Veer takes his wife out for a walk through the park. They have their driver / bodyguard with them as well, and the couple parades around a spinning sculpture that looks like a giant wheel with sails coming out of it. They have fun joking around with each other, and so seems to be going well, until the three of them get attacked by wolves. What’s especially cool here is that we see the wolves vision with its distorted coloring and imagery, and follow the attack from the wolves point of view. This is what brings Wilson in. Van Der Veer was a big shot and this is a huge case for the city. The mayor wants it solved immediately. Wilson is retired, but he is brought back for this case. It would have been nice if the movie spent a little more time developing and explaining that idea, but it is really just rushed over as a side-note attempt at giving back story. Was Wilson an expert in this field? Was he forced to retire? All we know is that he leaves Staten Island in a helicopter and lands in Battery Park, in lower Manhattan, and right away starts looking for clues. Wilson doesn’t find very much. Considering that the attack was by wolves, one thing annoying is that the detectives in this movie take a really long time to figure that out. For a good portion of the movie, they think they’re looking for a human murderer, and even consider that it might be a terrorist. I suppose the point of that is to make us think we are looking for a werewolf who might have been in human form, or human enough to cover up the murder afterwards by making it look like a human on human attack. But if it really is a wolf, than the bites of a wolf would be significantly different than anything a human could do, and the detectives and coroners don’t seem to be able to figure that out. The zoo expert can tell that they are the hairs of a rare breed of wolf, and then he goes on a tangent about Native Americans and how their culture has a number of connections to that of wolves. This is about as serious as when in Mortal Kombat Annihilation, characters are told that every human has an animal spirit living inside of them, known as an animality, or in Teenage Mutant Ninja Turtles: Out of the Shadows, where we pretty much get the exact same speech about animal spirits, to explain how Bebop and Rocksteady are created. 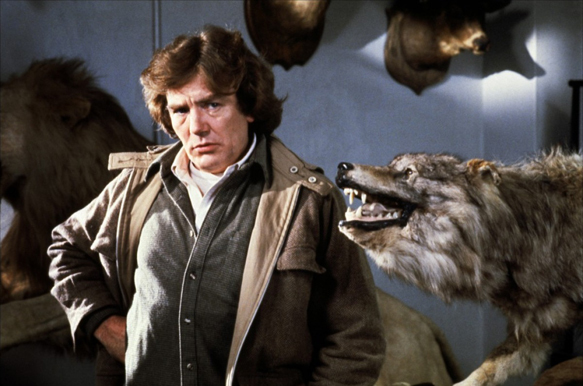 Only here, in Wolfen, it may be just as dumb as it is in those other movies, but Albert Finney and the dark tone of the movie actually sell this idea. Wilson believes it enough that he now goes to see a Native American activist, Eddie Holt (Edward James Olmos,) on top of a bridge, just to ask him questions about this. Holt is a bridge worker, just like the third victim, and Wilson has to climb up to the top of the bridge to get the interview. He does this using cool wires that he continues to hook and unhook onto every new beam he passes. And all that effort doesn’t really give him much. Holt claims to be a shapeshifter, and Wilson decides if there’s any truth to this, he wants to see it for himself. So he follows Holt that night to a beach where we get what should have been the coolest scenes in the movie, and an awesome werewolf transformation scene. This is where the movie decides it is going to mess with us as much as possible. I’ll just leave it at that. For what remains of the movie, main characters are dying in ways that are unexplained or irrational. And all we get from it is more talk about wolf spirits and how they tie into Native Americans. The Central Park Zoo expert decides to go walk around Central Park at night, on his own, under mysterious circumstances. It doesn’t work out so well. And the coroner who works with Wilson also finds himself in over his head. This is where the movie really goes off the rails. Everything starts happening quickly and we don’t exactly get much in the ways of answers or resolution. I’ve seen countless movies about werewolves, from Wolf to Teen Wolf to the Wolfman. They can be fun, but they can also feel kind of familiar. 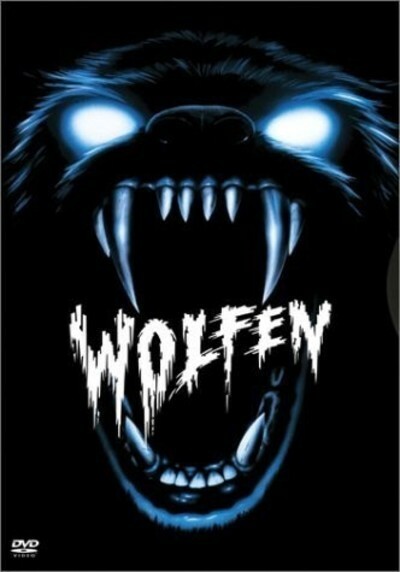 Wolfen is a movie that goes for something different. And normally that would be pretty cool, only here it takes a few too many liberties in order to make us think we are watching a werewolf film. First and foremost is that the coroners can’t tell the attacks were done by an animal and not by a person. That point could have been sold a lot harder if there were clues to help make us believe it. For example, there is a clear connection to a group of people who seem to know exactly what’s going on with the wolves in this movie, so why not have those people be more involved? Why not have those people be working with the wolves, covering up the murders? While the movie does kind of fall apart in the second half, the first half works really nicely as a sort of serial killer thriller. Finney is great as the unconventional lead, and I like the urgency of the case, to the point where if he doesn’t solve it fast, than somebody else is going to and it might not be the real solution or culprit, but just something that could be used to say they found the killer and sweep it under the rug. The idea to show the murders from the wolves point of view is pretty cool, and so is the way this movie uses different areas of New York City. But the reveals in the second half just aren’t enough. This movie dares to be different and by doing that, finds out the hard way that there’s a reason why the usual conventions work. That’s how and why they end up becoming the usual conventions. As a police thriller to be taken seriously, this one is pretty cool. As a strange movie about animal spirits, it doesn’t quite work.